A sprite is an extremely brief flash that streaks through the upper atmosphere. Sprites occur above thunderstorms and are among the brightest phenomena in the sky. They start in the mesosphere, at an altitude of about 75 kilometers, and can be 50 kilometers tall. 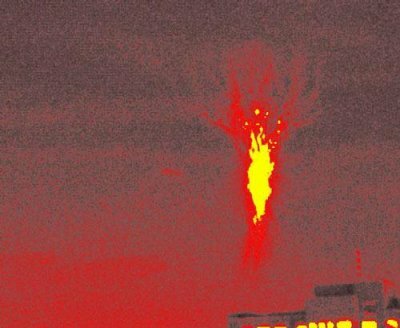 However, the bursts of radiation they emit are mostly in the infrared range and last only a few milliseconds, so that obtaining accurate recordings of sprites is a major challenge. The first detailed video images were recorded in 2006 by Steven Cummer of Duke University, Durham. His images showed that sprites are composed of falling columns of electrical discharge called streamers. In 2007, Hans Stenbaek-Nielsen, of the University of Alaska at Fairbanks used a more senstive camera capable of recording 10,000 frames a second. These new images showed that streamers are drawn by very bright dots, called streamer heads, which travel at 30,000 kilometers per hour.